I should clarify by 'surprisingly bad antialiasing' I meant 'surprising because I'd never noticed any problems with it in actual production renders.' I may have stumbled across a not-so-sweet-spot: Just the right combination of resolution, focal length, and object geometry to cause problems. This was a problem in 4.6, and it remains in the 5.0 beta. I first came across it while trying to fake a lightbulb in a hanging fixture, but it shows up in other circumstances, as well. The easiest demonstration is using a light source and a sphere on which I've mapped a partially transparent PNG as a texture. This is the situation where I first came across the bug. 1. 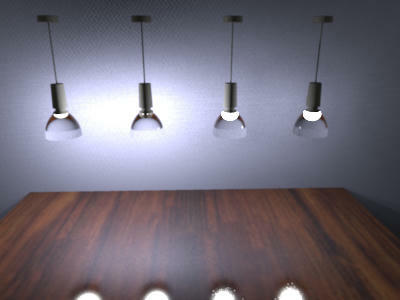 'Baseline' render of light source alone. Light at 1-inch diameter and 3-foot elevation, with a small square floor at 0 elevation. 2. Light source and sphere concentric, both with 2-inch diameter and 3-foot elevation. 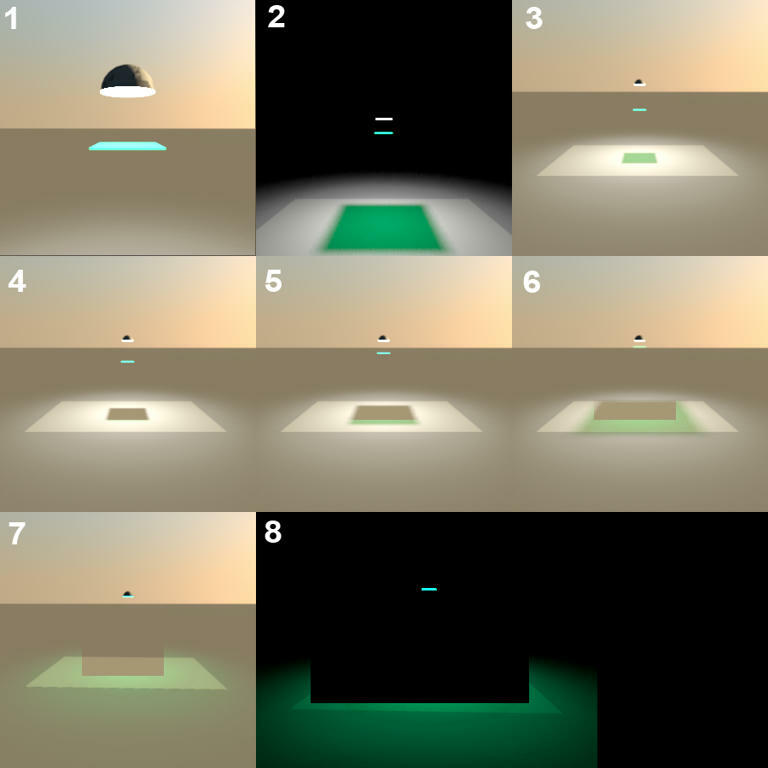 Sphere is not illuminated by light source; light is not filtered by sphere texture. 3. Light source and sphere concentric. Light has 2-inch diameter and is at 3' 1/8" elevation. Sphere has 2.25-inch diameter and is at 3-foot elevation. Light source is filtered by sphere texture (IIRC, 30% transparent PNG). Note dark rectangular artifact in center of image. This second example demonstrates a similar issue using a flat translucent filter a various distances from a light source. 3. Filter at 2' 0" elevation. No bug. 4. 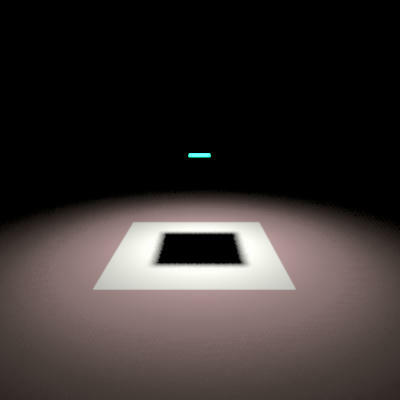 When filter is raised to 2' 2", the expected block of projected filtered light (as seen in the previous image) is somehow blocked by dark rectangular artifact. 5. At elevation of 2' 6", artifact still exists; projected block of filtered light is larger than artifact and can be seen as colored fringe outside of artifact. 6. At elevation of 2' 9", artifact remains, with filtered block increasing in size. 8. 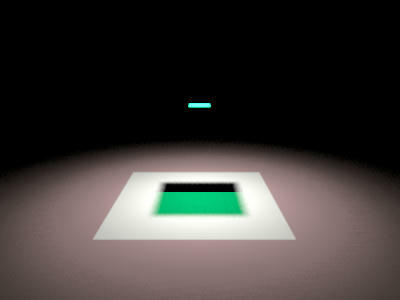 'Nighttime' variant on render 7, clearly demonstrating artifact. A few more examples. Without going into too much detail, these are test renders I generated a couple of months ago while experimenting with the use of translucent gradients to create directionally variable lights. However, what's important here is *not* my oh-so-clever use of gradient textures ; instead, it's our old friend the Artifact that seemingly appears whenever a light source is completely enclosed in or blocked by other objects. The other two images show similar issues. Interesting story. But a bit hard to follow without the sh3d file. Can you share it? Tonight, the Beta 13 brings updated translations in Chinese (Simplified and Traditional), Japanese, Russian, Bulgarian, Greek, German, Czech, Italian and Spanish. It also brings updated help in English and French and fixes the regression reported by Mazoola about sloping walls (thanks for the details!). fixes the regression reported by Mazoola about sloping walls (thanks for the details!). It just took me a while to figure out when it did and did not display this behavior. But a bit hard to follow without the sh3d file. Can you share it? Hans -- Not sure which sh3d file you mean, but they're both (all?) small. I'll try to get them online when I get back to the house later tonight. In the font selection dropdown for text elements, please create an additional entry to set the font to the PROGRAM default font. Currently there's only the option to use the system default font. Now that you have a program default font, this should be possible to use also by default for texts. here are a couple scene files that demonstrate the rendering issues I mentioned a few days ago. With luck, it's something I'm doing wrong. 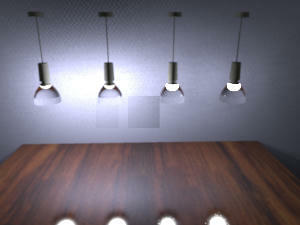 First is the file for the last image from my previous post, the one with the four lighting fixtures. (The scene file contains a model from 3DWarehouse, which appears to be permitted under the terms of their General Model License Agreement as of 18 March 2015.) It's a good thing you asked for the scene file, as I'd evidently forgotten exactly what it included. Here, each fixture contains a sphere (with what I think is a 50% translucent white PNG mapped as a texture) representing a light bulb. Inside that sphere (concentric, but with a smaller radius) is a low-output (2%) light source whose sole purpose is to illuminate the 'bulb.' Outside the sphere (concentric, larger radius) is another light source that lights the scene itself. The two fixtures to the left in the image below have a 3" sphere for the bulb, lit from within by a 2.75" white light source at 2%, and surrounded by a 3.125" white light source at 15%. I have disabled the internal light source for the second fixture from the left to show how the 'bulb' disappears. The two fixtures on the right are the same as those on the left, except they have a slightly larger sphere (3.375") surrounding the outer light source. This additional sphere has a white PNG with a gradient transparency ranging from 15% to 50% mapped to it; the sphere is aligned so its most opaque portion lies between the light source and the wall at the back of the scene. Most likely, I could eliminate the internal 'bulb' sphere and light source, downsize the gradient, and let the gradient serve as my bulb -- but the render artifact makes that a moot point. ...except that, here, it doesn't: There doesn't seem to be a visible artifact in this render using Beta 15. ...except that it reappears when rendered at other sizes. For instance, here's the same image, rendered using the same settings -- only generated at a width of 300 pixels rather than 400. I evidently didn't save the scene file for the other test from my previous post, so I had to slap one together. I think it's essentially the same as the original. When I replace the bluetint box with the transparant glassblutint box (in List Attachments) the shadow disappears. This makes me think there is some kind of error in the model or the texture you used. 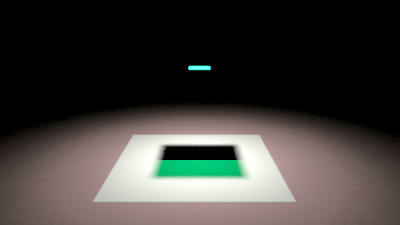 This suspicion is strengthened by the fact that the green/black doesn't always appear, and not always in the same spot. Sketchup models (DAE) are known to produce this kind of behaviour when textures are not applied to both sides, when SH3D cannot decide which side has the texture.